As the San Jose Sharks clinch their fourth-consecutive berth to the Stanley Cup Playoffs, blind hockey fans take aim at the NHL team’s failure to ensure equal access to the digital fan experience. The San Jose Sharks + SAP Center mobile application—a key digital piece of fans’ interaction with the stadium and the team—is ubiquitously inaccessible via the assistive technology, called screen readers, that blind individuals use to access such services. Find a copy of the complaint below. Marco Salsiccia has been a San Jose Sharks fan ever since the team’s inaugural season in 1991. When he lost his vision suddenly in 2014, he feared that attending hockey games would no longer be enjoyable, but he found that by going to the SAP Center (called the “Shark Tank” by many fans) with a radio, he could listen to the stadium’s live, no-delay radio feed and follow the game at the same pace as all the other fans in attendance. Unfortunately, as the team started relying more heavily on its mobile application to engage and provide services to fans, Mr. Salsiccia discovered that he was not able to participate in the complete fan experience that sighted fans enjoy. People who are blind interact with digital content using screen readers—software that converts the app’s digital elements, such as images, text, buttons, links, and headings, into audible synthesized speech or outputs that information on a digital braille display. Currently, the Sharks’ mobile app contains pervasive barriers to individuals who access such features using screen readers. Because of these barriers, key functions of the Sharks app are virtually unusable for blind fans. 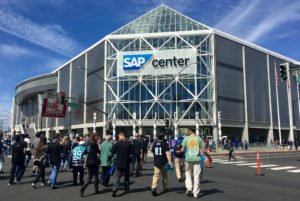 In addition to Sharks content, the San Jose Sharks + SAP Center mobile application provides sighted users services on behalf of the San Jose Barracuda, and city-owned facilities—Solar4America Ice at San Jose and the SAP Center. All of the app’s services and benefits related to these entities are completely foreclosed from individuals who are blind and use the native iOS screen reader, called VoiceOver, or the native Android screen reader, called TalkBack. These problems extend far beyond Mr. Salsiccia. According to census estimates, approximately 1.6% of the population of Alameda, San Francisco, San Mateo, and Santa Clara counties report vision difficulties. With Sharks attendance at the SAP Center averaging over 17,000 per game, and annual ticket sales for 2017-2018 non-sporting events at the SAP Center over 500,000—the inaccessibility of the Sharks + SAP Center app is potentially excluding thousands of Bay Area residents.